Inspiration is a quirky thing. It can happen in a nano second and erupt from the most unexpected sources. And writing inspiration is notoriously elusive at times - it has its own famously coined phrase - "writers block." Writing for a blog is no different. I have had my long stretches of silence in the last year - inspiration to write played a role. Imagine my surprise when I was sitting in a dentist's office yesterday - waiting for my turn in the chair - when I causally notice a book on the table beside me. Since my dentist doesn't stock his waiting room with the latest popular magazines (how will I find out how Prince George and Princess Charlotte are doing?? ), I picked up this book and started to page through it. 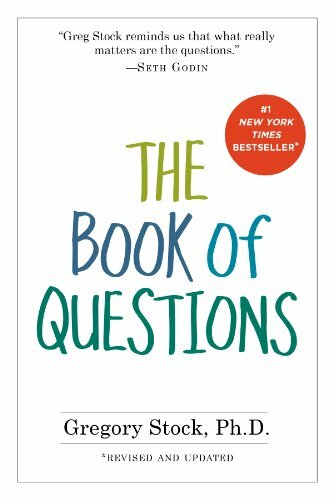 It was filled with questions that had no right or wrong answers. They were thought provoking questions and some of them were difficult to answer. I randomly looked through the book. Some I had easy answers to - some not. The 'nots' I skipped passed. No need to answer those questions. "Pay attention to which ones you're drawn to and which you shy away from. so a question you want to avoid might be the very one you should focus on." I paged back to the first question I had chosen to skip because the answer didn't spontaneous flow out of me. Technology has become a part of us. or one of your hands? And then the dentist called me to come into an exam room. Well, darn!! Couldn't he run late just this one time?? I thought about that question through my whole appointment. As I left the office I realized that a new series of blog posts just might have been born in the waiting room of a dentist! I went home and ordered the book. After much mulling over this question I finally have an answer. It is the right answer for me at this stage of my life. It might be a different answer for you - the right answer for you! Have you ever had a feeling, a thought that keeps returning ... that seems to grow in size until action spills out? Well, once again, I feel a need is growing. When we moved into this condo all our worldly belongings fit! Just fit! I was amazed at the time that I 'guessed' correctly in downsizing from a large townhouse into this condo. The decision of what would fit in a new abode was like trying to determine exactly which plastic food container to use when storing the chili that half fills your cook pot - and discovering the food container you picked held your chili perfectly - down to the last drop. When I guess correctly with a food container, I feel like doing a fist bump with someone - except that the available 'someone' usually is my husband who would roll his eyes if I asked him to fist bump over chili in a Tupperware container! Ha. Now we are settled into the condo and every last drop of our stuff still fits despite increasing some of our things ... but the thought keeps growing that maybe we moved stuff we didn't really need to keep. Yesterday my metaphysical food container - i.e. condo - tipped and dripped - the lid suddenly would not fit! What started the drip? My yarn. I have a fairly large inventory of yarn. It has been a 20 year collection in the making. And I have loved every minute of it. I moved all of my yarn from the townhouse to the condo. I got rid of a lot of other things to be sure I had enough room for the yarn. I don't separate easily from my yarn. One yarn I purchased about 10 years ago. It is a pretty nice acrylic with a small amount of wool. I am not generally a fan of acrylic yarn, but these were very nice colors to my taste, machine wash and dry, and good for garments without looking cheap. I purchased 4 complimentary colors ... a total of 16 skeins (I don't do anything half way). I didn't have a project in mind (always the kiss of death for me.) Anyway, I started several projects with this yarn over the years but nothing stuck. The yarn lingered in my stash. The week I started (multiple starts actually) for a child's sweater in this yarn. The yarn was perfect in weight, gauge and durability. But no matter how I mixed and matched the colors - I didn't like how it was evolving. The photo doesn't represent the problem well. - well the yellow reminded me of urine against the brown. I couldn't get passed that. The rust color make the brown strips look green. Icky green. How brown could look like green was beyond me. And then the light dawned on me. I began talking to this yarn - why do you look better wound up in the skein than worked up, why does everything I try with you fail, wouldn't you be happier with someone else, why am I keeping you???? It is time to set you free!!! (It is ok for you to roll your eyes now.) I walked into the guest yarn room and put all 16 skeins of yarn in a bag for a charity donation. It wasn't in a fit of frustration that I did this. I was calm and deliberate. And I am ready to see if other yarn that resides with me would be happier owned by someone else. Then I will start the process again to thin out my other belongings until the condo lid fits comfortably once again. The knee bone is connected to the stomach bone is connected to the ....! I think I am due for a Rant!! Exactly one week ago I awoke with a left knee that was talking to me. And by 'talking' I mean yelling. Both knees talk to me and have done so for years. You know what I mean - popping and clicking and sometimes little pains. But yelling - that is a very different kind of talk. I looked up a blog post that I did on my left knee (Yep! Only the best bloggers do blog posts on their left knee. Ha!) and it was November 2013. That was the last time my left knee did any yelling. I had ignored the yelling for quite sometime in 2013 before I was forced to seek medical help. And by 'help' I mean switching one problem for another. During the 2013 knee episode I saw my general doc and he sent me to an ortho doc and then I got handed off to physical therapist and eventually the knee pain resolved - after approximately 4 months - and lots and lots of Advil. And by 'resolved' I mean back to only talking ... not yelling. Talking I can live with. But now my stomach was talking (ok, yelling) at me because Advil is hard on the GI system. So the saga of the cranky knee continued through a visit to a gastroenterology who did an EGD (tube with a camera down the throat) to take a look around. It was simple reflux that was caused by the Advil. So I was put on a high end reflux drug that after about 4 months I stopped because ... wait for it ... it was adding to my leg cramp problem. (Jeez!!) It took a few years but just recently I got the reflux manageable with over the counter drugs and life style changes. So now three and half years later - that left knee is yelling at me again. AGAIN!!! I am not waiting another two months for it to go away before seeking medical help to resolve this issue. And by 'help' and 'resolved' I mean going to a rheumatologist who is better trained to treat possible arthritic conditions and management without the treatment taking out another organ system. So how many of you have problem knees? And what do you do for them? are starting to come due?? Left to right: mom, my sister and me! On this Mother's Day my mind continues to float back time and again to my mom and the last years of her life that we spent together. They were the hardest years of my life, but they were also the closest years to my mom. She needed so much help during that time and I gave my heart and soul to her needs. I don't regret a minute of it - the hard, frustrating, and sad minutes, hours days - no regrets. I wish I could have her back for just one hour now to tell her how much I appreciated everything she did for me during the years she was raising her two girls with an alcoholic husband! The years I gave to her at the end of her life do not begin to equal the years she gave me during the beginning of my life. Readers who have been with me for a long time may remember a long series of posts I did on my mom. They are found under the label of Through My Caregiver Eyes (just click on that title under Labels on the right side of my blog to bring them up sequentially) I started that series in August 2010 and my final post for it was in January 2015 - she died in December 2014. This series documents our time together and my growth into the caregiver role. If you or anyone you know are heading into care giving for an elderly person, reading about another's experiences can be helpful. Care giving can be a very isolating and sad struggle. It helps to know your story is not so much different than many others. If you are lucky enough to still have your mom, love, care and appreciate her - not just on this day - but on all days. Some day in the future, she may not be around. to my readers who are themselves mothers! It is the most rewarding experience of your life! A series of posts on my new home. "I like this (xyz) so much better." Maybe I should write about it." I held up writing this last post because I was waiting on the instillation of 2 light/fan combos for the dining area and the den. Since moving into the condo 8 months ago, we have replaced many old and outdated items. These light/fan combos are the last of those changes to be done this year. The light fixtures that came with the condo were pretty ugly to my taste - and, more importantly, we wanted ceiling fans so we could reduce our need for air conditioning. Electric can be expensive. and den straight ahead and center. Entering the condo you walk into a small foyer space with a view of the dining room, living room and den. This open design works well in a condo with reduced square footage. One space simply flows into another without the barrier of walls. So many condos had less square footage than this condo AND lots of walls. Walls shrink the feel of the space and place limitations on its use. to the right just out of sight. A good example of limitations is our dinning room table. It is a bit large and can be made larger by another 4 feet of extensions. In the townhouse we always angled the table from one corner of the room to an opposite corner when the extensions were used. It worked mostly but was tight for guests getting around the table. I always said ... if we could just push the walls out another 18 inches it would be perfect! Ha! In the condo the dining table fully extended spreads into the adjacent living room space a bit and can be moved around easily by guests. No need to wish the walls out another 18 inches because there are no walls. The dining room also displays 3 leather game boards we dearly love. During more affluent years - when we were both working and had good salaries, we frequented craft shows. These boards were several of the many items we purchased. And we still love them as much as we did when purchased. Still loving something after years of ownership is the sign of a good purchase. The living room space is defined mostly by the arrangement of furniture. In the fore ground is the back of a couch that backs up to the den. It has a cover over it - pets, you know!! Our living room chairs are placed fairly close to the TV so my husband has the best chance of seeing the TV. You can tell which is my chair. It is to the left, has a hand-spun hand-woven shawl over the back - which my dear cousin made and which is used almost every single winter morning. near me or on me all the time! My chair, where I am sitting right now!! My chair is surrounded by yarn - and it is located next to a display cabinet that houses even more yarn and my legos. My little space. The den has a more defined area because there are more walls but one corner is open with no door. It makes for a very open feel when entering the condo. I love love love that there are no sliding glass doors in this condo. After 40+ years of sliding glass doors, I was ready to return to a standard door for the deck. So that concludes the tour of my condo. We have made a number of changes and adjustments, and as a result, I have become at ease living here. This condo was the first place in 45 years that wasn't new when we moved in. That bothered me some. But it had been maintained for 12 years by people with similar tastes. Now with the changes I made, this space is more mine. Glad to finally feel like it reflects me - rather than someone else.